Berkeley Art Works spotlights 28 artists from the Eastern Panhandle with the Third Annual Eastern West Virginia Regional Juried Art Exhibit. The Gallery Exhibit featuring paintings, drawings, photography, sculpture and digital works, is on display through November 8. The public is welcome to tour the Exhibit free-of-charge Wed-Thu 11-5, Fri 11-8, Sat 10-5, and Sun 12-3. 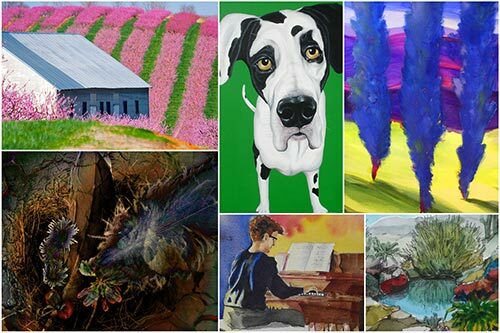 A Reception recognizing all exhibiting artists and announcing Third Annual Eastern West Virginia Regional Juried Art Exhibit winners will be held on Saturday, October 17, from 3–5 pm. The Reception is also free and open to the public. The Eastern Western Virginia Regional Art Exhibit will also be on display during a special Open House on Saturday, October 24, 2-5 pm, in conjunction with Main Street Martinsburg’s Chili Cookoff. The Exhibit was juried by Rhonda Smith, Chair of the Department of Contemporary Art and Theater at Shepherd University. “I selected paintings and drawings that demonstrated a facility and a relaxed manipulation that comes when a person is confident in both their drawing skills and their ability to manage the media,” Professor Smith wrote in her Juror’s Statement. Berkeley Art Works is in downtown Martinsburg at 116 North Queen Street. Gallery hours are: Wed-Thu 11-5, Fri 11-8, Sat 10-5, and Sun 12-3. The Art Works gallery includes a co-op space that represents 18 artists and artisans plus exhibit and classroom spaces. Co-op artists offer a variety of one-of-a-kind items that make unique gifts or personal treasures. Art instruction is offered for all skill levels. Visit the Web page at http://www.berkeleyartswv.org/artworks/instruction/ for a complete list of upcoming classes. Consider becoming a Member of The Berkeley Arts Council, the nonprofit organization that manages the Berkeley Art Works Gallery. Participate in exclusive behind-the-scenes opportunities to hang exhibits, work alongside artists, and support the arts in Berkeley County. Visit http://www.berkeleyartswv.org/join.php#online to join. The Berkeley Arts Council has added a new Beginning Waterolor Pencil class to it’s November schedule of classes. The class will be held Wednesdays November 4, 11, 18, and December 2 from 1-4pm at the Berkeley Art Works, 116 North Queen Street in Martinsburg. The four week class is appropriate for students who have no watercolor painting experience as well as those who currently paint with watercolors, but who want to expand their techniques. 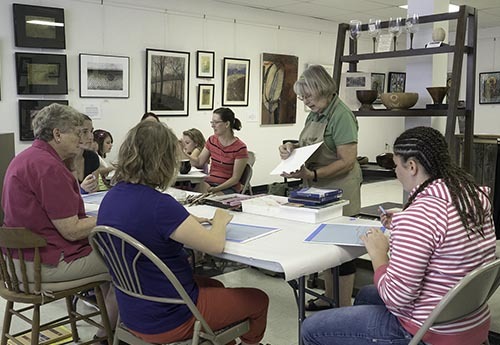 Students will learn how to lay down colors to create multitudes of variations of hues, of achieving many different textures, and of the ease of using the pencils when traveling, journaling, making their own greeting or note cards, or when sketching as well as painting entire compositions. Previously announced classes are second level classes in drawing, oil painting and color pencils. Details and online registration are available at http://artworks.berkeleyartswv.org/instruction/ or call 304-620-7277 for more information.